Walmart may turn to an unlikely source to attract more shoppers and fight off Amazon. Walmart (WMT) is in the early stages of talks to buy the health insurance giant Humana (HUM), according to a Wall Street Journal report published late Thursday. A Walmart-Humana deal would transform America's largest retailer and shake up the health care industry. Humana, valued at $37.5 billion, would be the largest acquisition in Walmart's history. Walmart, already one of the largest pharmacies in the country, could present itself as a one-stop shop for Humana's 14.2 million policyholders and bring in new customers with an expanded focus on health and wellness. The deal would also allow Walmart to control health care for its employees and defend itself against Amazon as it creeps further into health care. Health care is a "major growth sector," said Neil Saunders, managing director of GlobalData Retail, a consulting firm. "Moving onto this turf would give Walmart a whole new arena in which to expand [and] would be valuable at a time when its retail margins are under pressure." Walmart's 5,300 physical stores in the United States already compete with Amazon (AMZN), Target (TGT), Costco (COST), dollar stores, traditional grocery stores and discount grocers. The company has expanded online, but its digital sales slowed last quarter, sending the stock tanking. Walmart has maxed out its existing market base of less affluent Americans and is looking for ways to find more customers, according to Paula Rosenblum, a managing partner at Retail Systems Research. Dollar stores have already taken away lower-income customers, and Amazon has limited Walmart's ability to attract wealthier Americans. Rosenblum said a merger with Humana would fit into CEO Doug McMillon's strategy to bring in new shoppers and make it a more attractive place to work. Under McMillon, Walmart has bought brands such as Jet, the online shopping site, and Bonobos. It has also raised its minimum wage in recent years, in part to fight criticism that it underpays workers. With Humana, Rosenblum speculated that Walmart might offer health insurance for employees to retain them in a tight labor market. Walmart is the largest private employer in the country. It employs 1.5 million Americans, according to its most recent quarterly filing. A takeover is only one option the companies are discussing, the Journal reported. Walmart already partners with Humana on a Medicare prescription benefit, and the companies could expand that partnership. Humana's policyholders include millions in Medicare-related plans. Taking full control of Humana could push them to fill their prescriptions at Walmart stores and then go shopping for everyday products, said Ana Gupte, an analyst for Leerink Partners. Scooping up Humana would also allow Walmart to delve deeper into its customers' health care needs, said Gurpreet Singh, partner in the health services sector at PwC, a consulting firm. Access to Humana's medical data would give Walmart more insight into its customers and the people who live around its stores. If a certain community has high rates of heart disease or diabetes, Walmart could display and advertise items that address those conditions more prominently, for example. "It would provide Walmart with better data and information on what to promote and what to provide for certain populations," he said. Buying Humana could also bolster Walmart's fledgling foray into retail health clinics in a handful of its locations. Insurers generally employ medical professionals, such as registered nurses, to assist policyholders with basic care. A combined company could offer that to store customers as well — an enticing notion at a time when more health care is being delivered outside of hospital settings. "In addition to selling prescription pills, Walmart could develop a pretty attractive line of business with walk-in or by-appointment clinics," said Erik Gordon, a professor at the University of Michigan's Ross School of Business. The potential deal is just the latest to roil the health care sector in recent months. CVS (CVS) said in December that it would buy Aetna (AET), and Cigna (CI)announced earlier this month that it would purchase Express Scripts (ESRX), a pharmacy benefits manager. Albertsons has made a bid for the roughly 2,600 Rite Aid (RAD) stores that Walgreens didn't purchase. Part of the recent merger frenzy stems from health care companies' fear that Amazon will upend the industry. Amazon has made its own inroads. 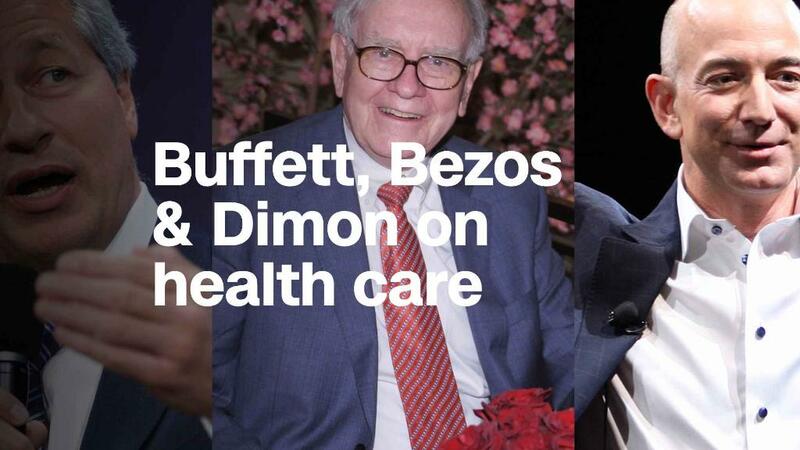 CEO Jeff Bezos announced a partnership in January with Warren Buffett's Berkshire Hathaway (BRKA) and JPMorgan Chase's (JPM) Jamie Dimon aimed at reducing the companies' and their employees' health care costs. Amazon has also rolled out a line of private label over-the-counter medicines and is building a business selling medical supplies to doctors, dentists and hospitals.